Globally rising level of air-pollution, deteriorating cabin air quality, and growing awareness toward passenger safety and comfort have resulted in an increased demand for automotive cabin air quality sensor. Moreover, stringent governmental regulations toward automotive emission, amount of CO2 released by vehicles and its concentration within the passenger cabin have also led to the burgeoning demand for air quality control systems. The automotive cabin air quality sensor market is estimated to witness robust growth during the period 2016-2022. The report is a compilation of various segmentations including a market breakdown by sensor type, vehicle type, and geographical areas. 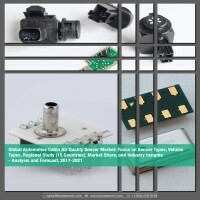 The report details the market analysis and forecast with respect to its various sensor types such as semiconductor metal oxide sensor and non-dispersive infrared sensor. While highlighting the key driving and restraining forces for this market, the report also provides a detailed study of the different vehicles that are analyzed including passenger cars (compact, mid-size, and luxury) and electric vehicles (battery electric vehicles and hybrid electric vehicles). It also details the leading players involved in the industry and provides an overview of the demand and supply side analysis of the market. • What is the expected global automotive cabin air quality sensor market size in terms of revenue and volume in the period 2017-2021? • What is the dominant type of sensor used in the vehicle’s cabin? • What is the revenue generated by the different sensor types, and vehicle types of the automotive cabin air quality sensor market during the period 2017-2021? • Which vehicle type will lead by value and volume in the global automotive cabin air quality sensors market by the end of the forecast period? • What are the major factors challenging the growth of the global automotive cabin air quality sensor market? • Which region will lead the global automotive cabin air quality sensors market by the end of the forecast period? The report includes an exhaustive analysis of the geographical split into NAFTA (the U.S, Canada, Mexico), Europe (Germany, the U.K, France, Italy, Russia, Rest-of-Europe), Asia-Pacific (China, Japan, South Korea, India, and Rest-of-APAC), South America, and Middle East & Africa. Each geographical region analysis details the individual push and pull forces in addition to the key players from that particular region. The report examines the role of the leading market players involved in the industry. The Company Profiles section includes highlights of significant information about the key companies involved along with their financial positions, key strategies & developmental activities of recent years (2014-2018). Some of the key players in the cabin air quality sensor market include ams AG, Axetris, Amphenol Corporation, Sensata Technologies, SGX Sensortech, Figaro Engineering, FIS Inc., and Paragon AG. 7.10 Sensata Technologies Holding N.V.
7.13 Standard Motor Products, Inc.
7.16 Zhengzhou Winsen Electronics Technology Co., Ltd. The automobile industry is undergoing dynamic evolution which is primarily attributed to the changing consumer preferences, growing focus toward driver safety, rising environmental concerns, and stringent government regulations aiming toward crash avoidance rather than crash survival. In the last decade, automobiles have undergone massive technological advancements in terms of vehicle performance, passenger safety, communication capabilities, driving comfort, and disruptive trends such as ride-hailing and car sharing facilities. These improvements have led to a surge in the number of on-road vehicles, elevating the need for the safer movement of automobiles. Additionally, a high number of vehicles has also led to a massive increase in the air pollution, globally. Among multiple problems affecting passengers, the problem of air pollution is the most devastating, causing a direct and serious threat to the well-being of the passengers. Air quality inside the cabin of any vehicle is four to five times worse than the quality outside the vehicle. Several independent studies have shown that the concentration of Carbon Monoxide (CO), Hydrocarbons (HCs), and Nitrous Compounds (NOx) found inside the vehicle cabins was detrimentally high. High concentration of these pollutants inside the vehicle is responsible for multiple health-related issues including fatigue, headaches, dizziness, and nausea. Fatigue has been regarded as the sole reason for 20% of the fatalities related to accidents. It often leads to lack of sleep, loss of alertness, inability to concentrate, and slow reaction. In order to deal with these problems, automotive Original Equipment Manufacturers (OEMs) have started appending air quality control or monitoring systems in vehicles as a factory installed offering. Initially, air quality control feature was reserved for the top range vehicles, however, lower manufacturing costs of sensors as well as high awareness of the public pertaining to air quality, in general, has widened the use of Air Quality Sensors (AQS). The report defines and estimates the market size and future growth potential of cabin air quality sensor market during the period 2017-2021. The global cabin air quality sensor market revenue is expected to reach $1,362.7 million by 2021 growing at a CAGR of 18.4% in the period 2017-2021. The global cabin air quality sensor market has been driven by increasing demand of passenger cars and electric vehicles, growing awareness pertaining to air quality, safety, and health concerns, and improved offering from automotive OEMs at the convenient price point. In addition to this, an increase in the number of product developments, collaborations, and merger and acquisitions, among others, are also witnessed in the past few years, thus fueling the growth of the automotive cabin air quality sensor market. In terms of vehicle category, passenger car segment is the most dominant one, owing to high sales of passenger cars especially in developing countries and increasing demand for passenger comfort and safety features across all types of vehicles. Electric vehicles category also holds tremendous potential in terms of market growth for cabin air quality sensors. Electric vehicles are widely regarded as the future of mobility and are witnessing high demand across all the major geographical regions including APAC, Europe, and North America. Semiconductor metal oxide sensors is the dominant category accounting for the lion-share of the total cabin air quality sensor market in 2017. Low cost, reliable performance, and small form factor are some of the reasons for the wide-scale adoption of the Semiconductor Metal-Oxide (SMO) sensors in automotive applications. Europe dominated the global cabin air quality sensor market in the year 2017. This was majorly due to the high demand of electric vehicles in Europe and growing focus toward passenger safety and comfort. In addition, favorable government regulations in Europe are also an important factor driving the demand for cabin air quality sensors. Some of the key players in the cabin air quality sensor market include ams AG, Axetris, Amphenol Corporation, Sensata Technologies, SGX Sensortech, Figaro Engineering, FIS Inc., and Paragon AG.